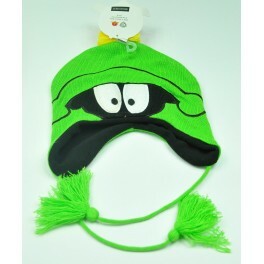 Keep your head warm with this Looney Tunes Marvin the Martian peruvian hat with a yellow pom pom top! For ages 14 and up. Keep your head warm with this Looney Tunes Marvin the Martian peruvian hat with a yellow pom pom top. Material: shell: 100% acrylic, lining: 100% polyester, filling: 100% acrylic. For ages 14 and up.